3 Buttermilk Pancakes, 2 eggs, and sausage or bacon. 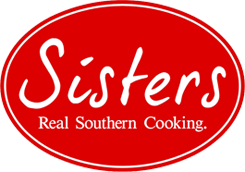 Our southern traditional meals will make you think of wonderful dinner at big Mama's house. All dinners served with 3 sides. Seafood dinners served with 3 sides. Three layer cake with two layers white velvet, and one layer red velvet. For a Limited Time Only! Enjoy our Breakfast Special! (6:00am-10:00am Monday-Friday) Choice of bacon, sausage patty or smothered chicken. Includes grits, eggs & biscuits. Prices Per Person. You Can Get Cornbread For An Additional $0.50 Per Piece. No Substitutions. Choose from two pan sizes: Half Pan (feeds 18 people) or Full Pan (feeds 35 people). 16" Round. Includes: Swiss, Cheddar, Pepper Jack. 16" Round. Includes: Strawberry, Cantaloupe, Pineapple, Grapes, Watermelon, Honey Dew. Per lb. - 1 lb. = 8 pieces. Box Lunches Consist of Lunch, Drink and Dessert. Rectangle, 8' X 4'. Seats 10-12.